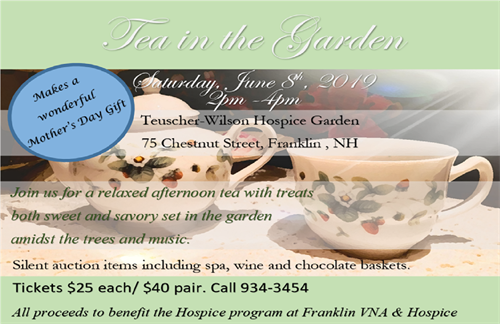 Join us for a relaxed afternoon tea with treats both sweet and savory, set in the garden amidst the trees and flowers of the Teuscher-Wilson Hospice Garden at 75 Chestnut Street, Franklin, NH. Live classical guitar music, three course tea menu and silent auction, including spa, wine and chocolate baskets! A wonderful gift for Mother's Day, a treat to yourself, or someone else you love! Tickets $25 each or $40/pair. Call 934-3454 for tickets. All proceeds to benefit the Hospice program at Franklin VNA & Hospice. $25 per ticket or $40 per pair.